How to access Feedback Studio to mark a Turnitin submission online. 2. Click on the name of the Turnitin Assignment for which you want to check submissions. 3. You will be taken to the Assignment Inbox, where you should see a list of submissions made by students on the course. Click on the pencil icon to open a paper in the GradeMark view. If you have already entered a mark for a submission, this mark will be shown in place of the pencil icon. 4. The selected paper will be opened in the GradeMark view. The blue buttons in the side panel denote the online marking tools. 5. The QuickMarks button will show you your QuickMarks pane, where you can select QuickMarks, or move between different QuickMark sets. 6. The Feedback Summary button will take you to the section of Feedback Studio where you can add and edit general comments and voice comments. This area is useful for providing overall feedback relevant to the submission. 7. The rubric / forms button will display the rubric or grading form which is currently attached to your assignment (but only if you’ve attached one to the assignment). 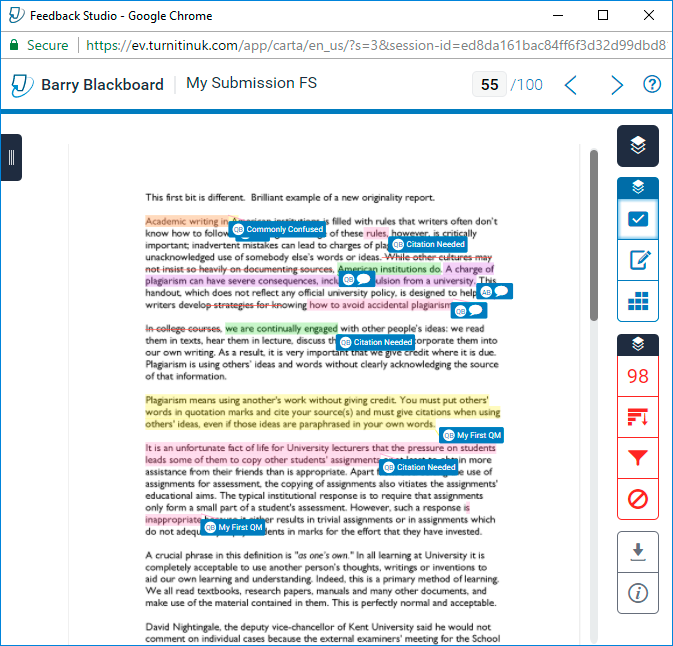 Turnitin’s GradeMark tool has recently been given a makeover and a new name, ‘Feedback Studio’, although you will still hear us using both terms interchangeably for the time being. The redesign has been on beta release for the last 18 months, but was finally pushed into full release in summer 2017 (with the old interface being switched off). The new interface has been available in our instance of Blackboard since June 2017. 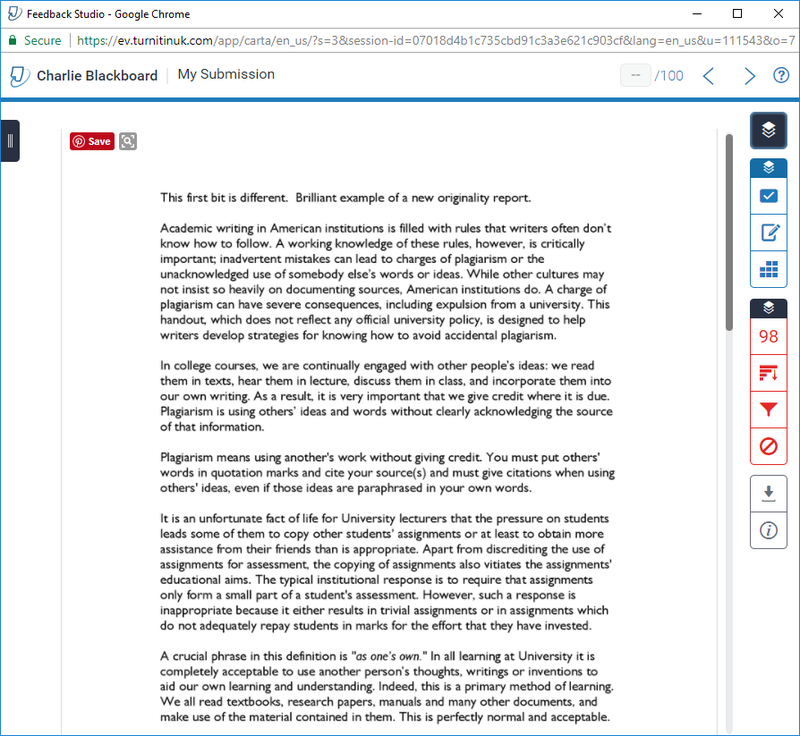 The new ‘Feedback Studio’ interface applies to (and integrates) both the online marking tools and the originality report features of Turnitin. The new interface has been freshened up, and introduces some small changes in how certain things are done. We recommend that users try out the new interface before heavy marking periods to familiarise yourself with the changes. No, staff will not need to do anything to see or use the new interface. All users will automatically see the new interface when they mark work or view an originality report. All that we ask is that you remain patient when using the new interface (as some things will have moved around or may work slightly differently to what you are used to), and contact ServiceLine (serviceline@soton.ac.uk / x25656) if you have any questions about using the new interface, or to give us any feedback which we can pass on to Turnitin. Does the new interface affect other areas of Turnitin? The only areas which have been re-designed are the marking interface, and the originality report interface. These two main features have been more tightly integrated. Others areas which you are familiar with such as the Turnitin assignment inbox, and the process of adding assignments remain unchanged. There are two main changes – the most obvious one being a cosmetic change. In addition, there are some small chances to how you add comments to a submission (Turnitin have streamlined this workflow to remove the need to move your mouse around the screen quite so much). What does the new interface look like? Blue items are related to marking – adding QuickMarks and Comments, adding general feedback and audio comments, and rubrics. Red items are related to the originality report for the submission you are viewing. Grey items are related to downloading aspects of the submission, and viewing information about the submission. How to add a QuickMark (without highlighting text) when marking a Turnitin submission using GradeMark. 2. Click on the name of the Turnitin Assignment for which you want to mark submissions. 4. Using the right hand QuickMark menu, select the QuickMark you want to add to the paper you are marking. You can either click the QuickMark once, or drag and drop the QuickMark to the relevant place in the paper. Note you can also change the active QuickMark set by clicking on the button in the top left of this frame. 5. The QuickMark will be dropped into your page but may not be where you want it to be, unless you used the drag and drop method in the previous step. 6. Hover over the QuickMark so that it expands. You can now drag and drop the QuickMark so that it is located in the desired area of the paper in the even that you did not drag and drop it to a specific place earlier. How to add and edit text comments when marking a Turnitin submission using GradeMark. 4. Before you add a comment, make sure that you have Bubble Comment selected in the top right area of the screen. 5. Click on the area of the document where you’d like to add your comment. 6. Using the text box, add your comment and then click on Save. The comment box should disappear and be replaced by a small blue icon. 7. If you hover your mouse over the blue comment icon, the icon should expand to show the comment you have written, along with an edit button. If you want to edit your comment you can do so by clicking on this button. 8. You can now edit your comment. Note that there is also an option to save this comment as a new QuickMark. You might wish to do this if the comment you have entered is one you intend to use regularly. You can do this by clicking on Save as new QuickMark. 9. Give your new QuickMark a title and use the drop down menu to select the QuickMark set you wish to add your QuickMark to. Once you have done this, click on Save. Note that once you have saved a comment as a QuickMark you cannot edit it directly through the comment in the paper. Note any edits to QuickMarks made through the main QuickMark editor will result in the edit being visible in all papers where the QuickMark has been used. This guide explains how to add voice comments to a Turnitin submission using GradeMark. 2. Click on the name of the Turnitin Assignment to which you want to add a voice comment. 4. Click on the General Comments button in the bottom right hand corner of the screen, as highlighted in the screenshot above. 5. Click on the microphone icon. 6. Select Allow if you see a popup asking for permission to access your camera and microphone. You may also wish to select Remember. Click on Close. 7. Record your comment. You should be able to see a blue bar moving up and down when you speak. Once you have recorded your comment (which can be a maximum of 3 minutes per submission), click on the blue stop button. 8. Once you have recorded your comment, you will have an opportunity to play it back to yourself to make sure you are happy with it. Once you are happy with the recording, click on the blue save icon. If you are not happy, you can click on the dustbin icon to delete your recording and start again. 9. You may see each of the stages shown above whilst your recording is saving. Longer recordings will take slightly longer to save than shorter recordings. Once the blue bar shows Saved!, your recording has saved successfully. How to access GradeMark to mark a Turnitin submission online. 4. The selected paper will be opened in the GradeMark view. The screenshot above explains the various elements of the GradeMark view on a PC. How to switch between different QuickMark sets in GradeMark. 1. The current QuickMark set is shown in the grey bar at the top of the QuickMark area. This usually defaults to ‘Commonly Used’. 2. In the upper left corner of the QuickMark area you can click to switch to a different QuickMark set. 3. The list of QuickMarks in the currently selected set are displayed in the main QuickMark area. 4. Click in the top left corner to choose a different QuickMark set, for example Punctuation. 5. Once you have selected a different QuickMark set, the new set will be displayed, with the name being displayed at the top of the QuickMark area, and the QuickMarks themselves being displayed in the main QuickMark area. How to comment on a specific part of a submission to Turnitin using the highlighter tool. 2. Click on the name of the Turnitin Assignment in question. 4. Click and drag over the text you wish to highlight. 5. Click on the Comment button on the right hand side of the screen. 6. Type your comment into the text box. Note that if you want to you can change the colour of the highlighter. This can be useful to differentiate between different sections of text. Once you have entered your comment and chosen the highlighter colour, click on Save in order to save your comment. 7. You should now see a blue comment icon along with your highlighted text, signifying that the comment has been added to the paper. If you hover over the comment icon it should expand, allowing you to edit the comment if you wish. 8. If you want to, you can select further text in order to add further feedback. In the following example, rather than add a text comment, we will add a QuickMark. Select the text you wish to highlight by clicking and dragging. 9. Select your desired QuickMark from the list on the right hand side of the screen. The list of QuickMarks available will depend on which QuickMark set is currently selected. You can choose a different QuickMark set using the button in the top left of the QuickMark frame. 10. Your QuickMark comment has been added to the paper. 11. You may wish to edit the colour of the highlighted text so as to differentiate it from other nearby text. If you hover over the QuickMark, it should expand. Click on the Edit button. 12. Select the colour you wish to use for the highlighter, and click on Save. 13. The highlight colour for the QuickMark has been changed. This guide shows how to add a score to a Turnitin submission using GradeMark. 2. Click on the name of the relevant Turnitin Assignment. 4. Click into the score box in the top right hand corner of the screen. 5. Type a number into the score box and then hit return. This guide explains how to add general text comments to a Turnitin submission when marking online using GradeMark. 5. Click either on the pencil icon or in the text area to add or edit the general comments for the paper you are marking. When adding general comments, you can write up to 5000 characters. The counter in the top right of the comments box helps you keep track of how many characters you have left. 6. Once you have finished adding your general comments, click the save button at the bottom of the page.